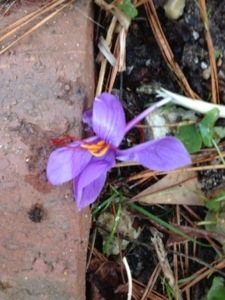 Saffron and other Fall blooming crocus. | Arthur in the Garden. ← The red shades of hellebore are blooming. Saffron and other Fall blooming crocus. 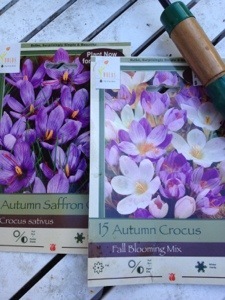 I totally forgot that before Christmas I had purchased a few packs of Fall blooming crocus and Saffron crocus, which also blooms in the Fall. They have begun to grow scales, leaves, and two had open flowers but they should settle in and compete a Fall blooming cycle. 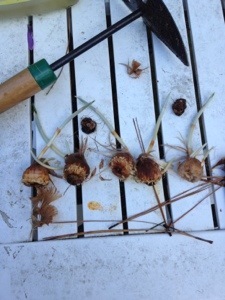 Of course, I could never harvest enough saffron from a dozen bulbs to make the effort worth while. That is why saffron is such an expensive spice. The stamen with the pollen are picked and dried. They are called threads once dried. I planted them in about five patches so they could create colonies in several locations around the garden. 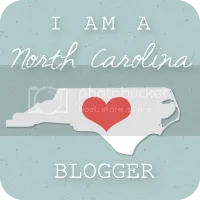 They should make nice colonies and provide some Fall color. That is if the voles do not eat them!